Nikolay Davydenko is through to the Qatar Open final in Doha after his second successive win over Roger Federer. (CNN) -- Roger Federer has crashed out of the Qatar Open in Doha at the semifinal stage -- losing to Nikolay Davydenko for the second successive match. The Russian, who beat the world number one in their last meeting in the last four of the ATP World Tour Finals in London in November, triumphed 6-4 6-4 in one hour and 20 minutes. 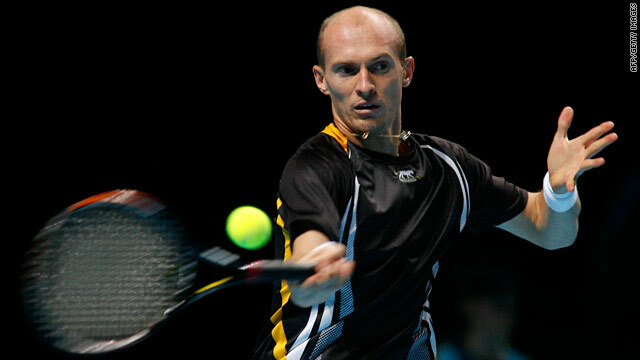 Davydenko will play second seed Rafael Nadal in the final after the Spaniard earlier made short work of Viktor Troicki. Federer faced 10 break points against the third seed as his serve let him down badly, his 55 per cent of first serves paling in comparison to Davydenko's 79 per cent. The Swiss saved seven of those break opportunities, including five in the first set, but managed just a solitary break of serve himself. World number two Nadal cruised to a 6-1 6-3 win over fifth-seeded Serbian Troicki in one hour seven minutes. The Spaniard converted three of his four break points in a one-sided opening set, winning an impressive 65 per cent of points on Troicki's first serve. Nadal set up four more break opportunities in the second set, taking two, as the Serbian again struggled to cope with the four-time French Open winner's powerful returns. Troicki also claimed a late break of his own, but it merely delayed the inevitable. Meanwhile, Andy Roddick has confirmed he will not play for the United States in David Cup this year. The 27-year-old, who injured his left knee last October, is hoping to avoid more knee problems by cutting down on the number of times he changes court surfaces. Roddick made the announcement after beating Richard Gasquet of France 6-3 7-6 in the quarterfinals of the Brisbane International. The American will now play Tomas Berdych in the last four, after the Fourth-seeded Czech booked his place with a 7-6 2-6 7-6 victory over Brazilian Thomaz Bellucci.